What to keep in your tennis bag? This is the question that bothers several beginners as well as professional tennis players. The type of tennis equipment and accessories that you put in your tennis bag entirely depend upon your actual requirements and the level of tennis you play. The most important tennis equipment you need is obviously your tennis racquet and tennis balls. Some tennis clothes such as your t-shirt and shorts are also essential as a tennis wear. 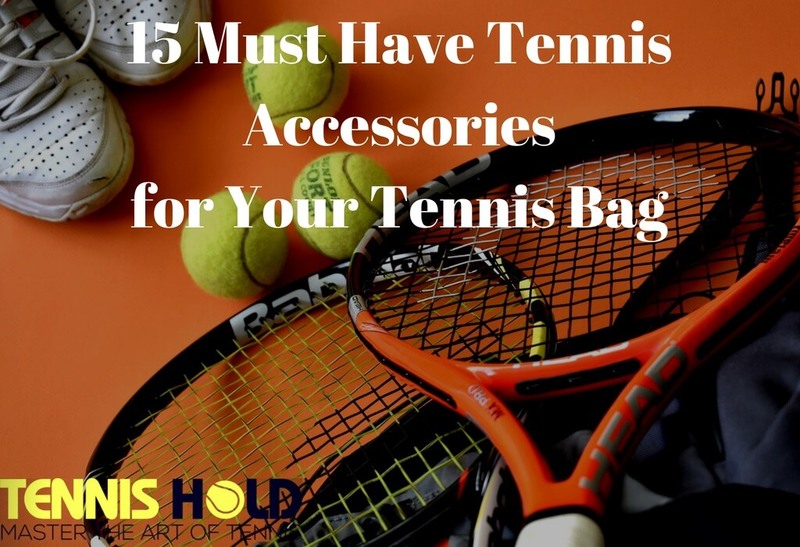 But it is not just your racket, tennis balls and clothes but you also need some extra accessories if you really want more comfortable and relaxed tennis playing experience at the court. To carry a player’s usual racket (head-light type) or a power racket (head-heavy type), you also require right tennis strings. There are basically three types of tennis strings available. One is synthetic strings, other one is natural gut strings and the third category is hybrid or mixed type. It always depends on what is your tennis skill level or your playing style as well as your tennis playing frequency. You need to choose your tennis rackets and tennis strings that are based on these parameters. Tennis racquets or in other words rackets are of course the most essential and the most primary things you need to store in your tennis bag. It is always a wise idea to take 1-2 extra rackets along with you as a backup option. If you are the player whose racket strings are often broken down during the tennis match, then you definitely need to carry more than one racket in your bag. One of the best rackets that I regularly use is Babolat Aeropro Drive. I recommend you to watch the following review video where you will learn all the amazing features and benefits of this Babolat racquet. And the other one I recommend you to use is Wilson Zero Strung Performance Racket. Both of them provides better performance, better grip, sufficient head size and easier handling experience. You need at least 3-4 packs of tennis balls. There are different types of tennis balls that depend on the type of tennis court you play on. Different kinds of tennis balls that are in use are heavy duty, regular duty, grass court balls, high altitude balls and pressureless tennis balls. There are also smaller sized tennis balls available for junior tennis players. The most promising and reliable brands in the market that offer high quality tennis balls are Dunlop, Penn, Prince, and Wilson. The two most reliable and durable tennis balls I recommend here for all tennis players are Penn Championship Extra Duty Tennis Balls and Wilson US Open Extra Duty Tennis Balls. Tennis shoe is another important item which can be stored in special shoe compartments that are available in some tennis bags. Specialty tennis shoes are essential to use on the tennis court if you are damn serious about your game. Many professional level tennis players use only high performance tennis shoes on the court. The main features that you should look for in your tennis shoes are stability, support, comfort, fitting and durability. Based on these features and factors, you should be able to find the best tennis shoes for your feet. I personally love to use New Balance MC806 Tennis Shoe for men. Watch the following review video where you will see all the features of this great tennis shoe. For women, I recommend to try out ASICS Women’s GEL-Resolution 6 Tennis Shoe. Watch the following review video that will describe all of the amazing features of this ASICS women’s tennis footwear. Both of these shoes offer better support, high performance, good traction and better cushioning features. Proper tennis clothes or outfits is essential to play tennis comfortably and without any injuries. There are several types of tennis outfits for male and female players such as tennis t-shirts, shorts, socks, polos, tees, headbands, wristbands, caps and visors. I recommend Adidas Training Ultimate Short Sleeve Tee and Champion Classic Jersey T-Shirt for male tennis players. Both of them are pretty comfortable, lightweight and offers great sweat and moisture absorption. Female tennis players also require special tennis sport bras for comfortable playing experience. Along with bras, they also require good quality skirts, tank tops, cap sleeve, compression gear, outerwear, and shorts, etc. In case you are a female tennis player looking for a good quality tank top then I recommend to try out Reebok’s Dynamic Fitted Racerback Tank Top. It is really comfortable, lightweight and absorbs moisture and sweat neatly. If you are looking for tees for tennis then Adidas Training Ultimate Short Sleeve Tee is perfect for you. Its Climalite fabric is really good for your skin and helps to absorb sweat seamlessly. On the other side, headbands and wristbands are also essential to use while you are on the tennis court. If you are a person who sweats a lot then you know how much sweating you experience during the actual match. When you want avoid your sweat constantly running down your arms and making your racket grip slippery, then you must use a quality and durable wristband. The one I use is Nike Swoosh Wristband. It is very comfortable and machine washable by nature. If you do not like to use a tennis cap or a visor that could restrict your sight or vision, then you can use a quality headband. I recommend you to use Nike Dri-Fit Head Tie 2.0. Natural gut strings and synthetic strings are essential to carry in your tennis bag as a backup option. In case, the strings of your racket are damaged, you need ready supply of new strings to string your racket quickly. You can read this Wikihow.com 13 step tutorial to learn how to properly string any tennis racket. If you need quality, durable and long lasting natural gut strings for your racquets, then I prefer you to try out either Wilson Champions Duo Natural Tennis String or Babolat RPM Blast Tennis String. If you prefer to use synthetic strings, you can use either Head Synthetic Gut Tennis String or Prince Duraflex Synthetic Tennis String. Both of them offers better performance and long-lasting durability. Overgrips wrap around your tennis racket as an extra layer. It helps in absorbing your sweat from hands and provides comfortable tennis playing experience. The best thing about using overgrips is they do not let your racquet slip from your sweaty hands when you play different strokes. Sometimes, it may happen that your racket can be slipped from your sweaty hands and your costly investment in your racket can be mistakenly damaged. This is where a quality and reliable overgrip on your racket helps you get a firm grip and also protects your racket from accidently falling on the ground while playing shots. Yonex Super Grap Overgrip is one of the best overgrips I have used for my new expensive racquets. And it has really provided me a better control and grip on all of my rackets. I recommend this overgrip not just to all tennis players but also to badminton, squash and racquetball players too. Watch the following review video where you will learn about the pros and cons of Yonex Super Grap overgrip. These days, there are several technological innovations happening when it comes to sport towels. There are some really best quality towels present in the market like Mission Enduracool Microfiber Cooling Towel. Watch the following review video explaining all the features of this Mission Enduracool Cooling Towel. These towels stay cool for hours when they become wet and remain soft and absorbent when they become dry. They really work great for keeping your body cool when you sweat a lot during tennis matches. They absorb your sweat and keep your body temperature under control during the play. If you play tennis more frequently like 3-4 times every week, then your body tend to get exhausted more often. In these conditions, your body constantly needs proper nourishment and hydration. This is when you require proper nutritional drinks, energy drinks, and energy bars. So, I recommend you to always keep sufficient stock of these items in your tennis bag. One good energy bar I can mention here for you to have is Powerbar Performance Energy Bar. It is full of protein and iron. You can consume it easily before and during your tennis matches to replenish your energy quickly. A quality material and durable water bottle is another essential stuff you need to have in your tennis bag. You need to drink water more often during the tennis matches as these matches can easily make your body dehydrated and exhausted. And you really don’t want to lower down your playing performance during the match due to sore muscles and dehydrated body. If you want to avoid these issues, then you need to keep drinking water on the regular intervals while you are on the tennis court. Therefore, always keep 1-2 water bottles with you to keep you properly hydrated and fresh. I use Camelbak Podium Big Chill Insulated Water Bottle while I play tennis. You can drink water from this bottle without spills and splatters. It has a secure lockout on the cap. You can easily shake and mix powdered drinks too. Plus this bottle material is a mixture of BPA free and BPS free Polypropylene with Hydro Guard. This keeps the original taste of water intact and its double walled design keeps water cool for several hours. I recommend you to watch this video to know more detailed features, pros and cons of this Camelbak Podium Big Chill bottle. Yes, a good quality sunscreen lotion or a cream is essential in your bag. This will protect your skin from excessive sunlight damage. I have seen several tennis players whose skin gets easily affected due to constant exposure to extra sunlight and weather changes. So, it’s always safe to take precautions than to be sorry later on. I use Aloe Gator SPF 40+ Gel to safeguard my skin while playing tennis on the court. It is being used by several professional tennis players. And it actually does the great job of protecting your skin against excessive exposure to the light. It approx. provides me 80 minutes of protection for my skin. Then you can reapply it to get more protection. You really will agree with me here that we all need a good old tennis hat and tennis visor when we play tennis match. You play out there in the bright daylight and you tend to sweat a lot during the gameplay. In this condition, you need to keep away your eyes from bright sunlight and the sweat that comes from your hairs. And here is where a good quality tennis hat and tennis visor will come really handy. They do really good job of keeping you focused on your game and not to get distracted by too bright sunlight and excessive sweating. Nike Aerobill Featherlight cap is a really good hat that I use and recommend to other players too. If you do not want to make your tennis bag another smelly locker room which is full of foul odour stuff like smelly shoes, socks and towels, then you must use sneaker balls deodorizer. These are super small and rounded design balls that will help you absorb odor from small and right places of your tennis bag. They fit very easily anywhere inside your shoes, towels, socks and your bag. They do the best job of keeping all the stuff inside your tennis bag fresh scented and odor free. I use this Sof Sole Sneaker Balls that do keep away all the odor and maintain my bag fresh smelled and germ free. If your feet are smelly and they do sweat a lot during the tennis gameplay, then you definitely need to wear thick padded sweat absorbing socks for your feet. They must be highly breathable and well cushioned as well. The socks that are thick padded provide better cushion for your feet. One of the best tennis socks that I use for myself is Thorlos Unisex TX Tennis Thick Padded Crew Socks. They provide much better cushioning, protection, comfort and odor free experience for your feet on the court. Vibration dampener may not seem so important for some tennis players but it is essential for your racquets. If you have one of these on your rackets then you definitely need to have 1-2 extra pairs of them. These vibration dampeners are great shock absorbers that help you play your game comfortably. They come in different shapes and sizes as well as in different colors. If you want your racket strings to produce less vibrations for every tennis shot, then you must have one of these on your rackets. I use Wilson Pro Feel Tennis Vibration Dampener for my rackets. It is of very high quality, affordable and easy to use. If you are really serious about your game, then you must be able to focus on the tennis court and specifically on the tennis ball that come from your opponent’s serve. You must also be able to protect your eyes from extreme UV rays and should not be blinded during the game due to excessive sunlight. Reliable and quality tennis sunglasses help you to protect your eyes from UV rays and help you focus your eyes on the ball which is very important. I recommend you to try out Bolle Sport Recoil Sunglasses. Because they provide your eyes the perfect optic vision that makes the court and the ball look white and yellow. It does dampen all the other colors which helps you focus on your game much better. So far, we have seen that there are at least 15 tennis items that you must have in your tennis bag. These are 15 most important and essential tennis accessories that most professional tennis players always carry with them. All of these items are necessary for you to keep playing tennis matches without any hurdles and discomfort. They will help you to play tennis comfortably and surely to raise your overall tennis skill levels.